When I was back in Motown (Monona) last week, I managed to find a little bit of time to make a Woodman's run. I've blogged about Woodman's before - excellent prices and selection. This time my goal was to score some beverages to take back home to Carlsbad. Since my bag was closing in on the magic 50 lb weight limit on the trip to Madison, I only grabbed one twelver. And it's a great one. 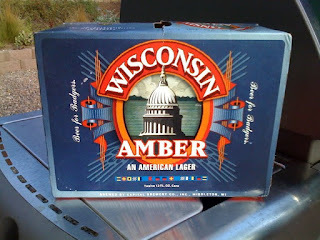 Capitol Brewery's Wisconsin Amber - the "Beer for Badgers", from Middleton, WI. Now I'm not a UW graduate, so I'm not technically a Badger, but for all intents and purposes, Wisconsin is where I have felt most at home during my life. A self-described honorary Sconnie. Canned beer travels well, I've flown back from Europe and Asia with various canned as well as some bottled beers with no problems. Same goes here, but I am somewhat surprised that the MSN TSA officials didn't snag a few for their morning breaks.